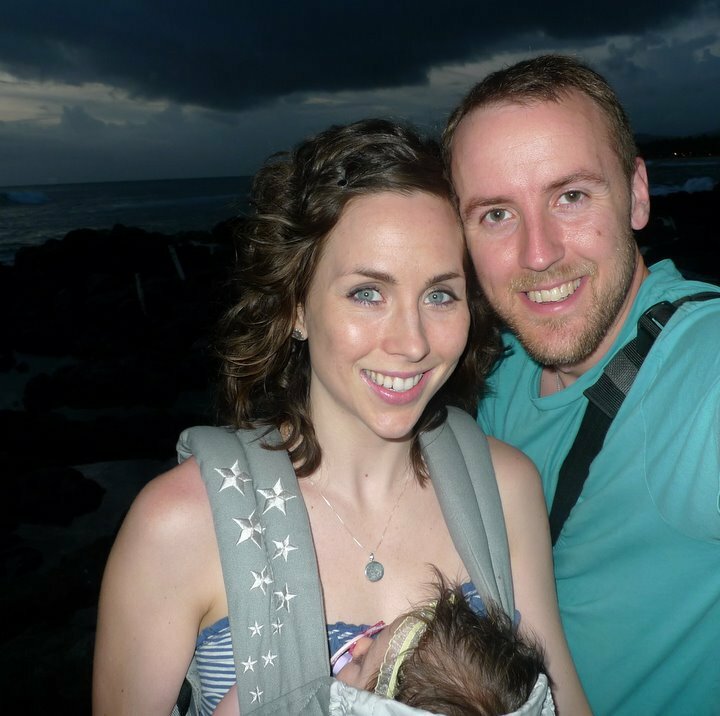 A few months before I started blogging, Shaun and I took a trip to Hawaii with Della (who was only two months old at the time). It was a fun trip, but I discovered while I was there that I don’t love Hawaii (because, apparently, if you don’t absolutely fall in love with Kauai, then Hawaii is not in your soul because it doesn’t get better than Kauai). Don’t get me wrong. Kauai is gorgeous. It just didn’t inspire the raptures in me that it does in some. So, when Shaun found out that he would be going to Honolulu on a work trip, my initial thought was that I would try to go, but I wasn’t as excited as you might expect. Mostly because–having traveled once before to Hawaii with a newborn–I knew the limitations/challenges. Della did AH-MAZING everywhere we went…even on the 6 hour flights there and back. She hardly made a peep. And Honor is an equally chill baby, so he probably would have done well too. But still…he is a newborn. 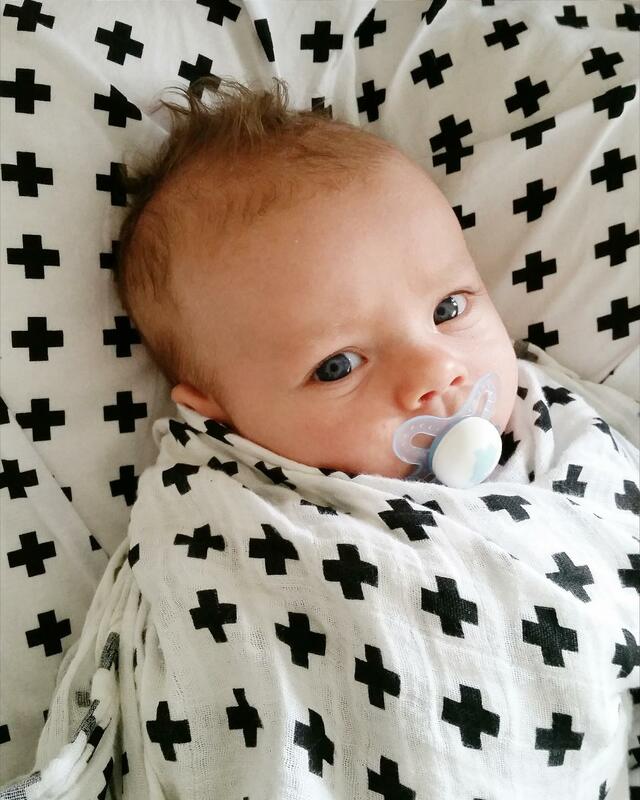 Who blows out his diaper, needs to eat often, and gets cranky if we can’t find him a quiet place to sleep. Plus! The timing was terrible. We’re smack dab in the middle of getting our house ready to sell, and, as my friend Kristy says: “There’s nothing like moving to make you feel like hoarder.” (AKA: what IS all this stuff, and what idiot bought it?? Oh. Yeah. Me). All that to say that I chose not to go. Instead I stayed home with 7 kids and did yard work. I know. What a doofus, right? But all I could think about was how busy Shaun usually is on his work trips and how I’m not a big beach girl and how I’d rather sell our house quickly than frolic by the pool. (Hmm…maybe not that last one). Turns out, this was one of Shaun’s least busy trips. He got to surf and hike. He has told me more than once that I “should have come” (although, he was fine/in agreement with my decision to stay). So, 7% of me (the whiny 7%) is all, “Booo! Poor me! Should have gone!” But the other 93% knows I did the right thing. The kids and I got SO much done (with help from my sweet parents, sister-in-law, and some awesome friends), and I know I would have been stressed by all that was still left to get done when I got back from Hawaii. Plus, a super bizarre thing happened to my dad, which, although not his fault at all, still required a lot of running around and trouble for my mom. And that stress would have been magnified greatly by having six kids under her care. For that reason alone, I’m grateful that I didn’t go and grateful that the Lord is sovereign even down to the smallest detail. Also, grateful that our flower beds are DONE! I’ve admitted here several times before that exteriors are not my forte. So, having that particular monkey off my back is a huge relief. We have friends whose family business is a plant farm, so last Friday, I dragged the four littlest out of bed before it was fully light and drove out to their plant farm, where our friend, Rob, proceeded to race me around helping me (code for: practically choosing for me, thank goodness) choose flowers. Then, I hustled home, unloaded the van, jumped back in and drove to town to teach my morning class. After which, I booked it home to start planting, stopping for mulch on the way. My mom and older kids were already there hacking away at my neglected flower beds. I know that I talk a lot about how #hardisnotthesamethingasbad and, honestly, I think that one of the hardest and best things in mothering is child-training. Especially training your children to do the right thing–i.e. obey, go to bed, pick up after themselves, speak respectfully, work. Sure, potty-training is rough, but it’s less of a heart issue than so many other aspects, and training your child to be diligent or full of integrity or kind is where the true mama rubber meets the life road. Surely, that’s why the Bible specifically commands us to: “Train up a child in the way he should go, and when he is old, he will not depart from it.” Proverbs 22:6. God knew we needed this promise. Because it’s just so much easier to do the chore yourself or ignore the eye roll or let the toddler sleep with you every night, amiright? Except that it’s really not. It’s easier at the time. But ultimately, laziness, whining, bad attitudes, and no sleep are a hardship on everyone involved (including the whiners) and makes the inconvenience of the initial training pale in comparison. Not to mention that kids can be genuinely helpful. 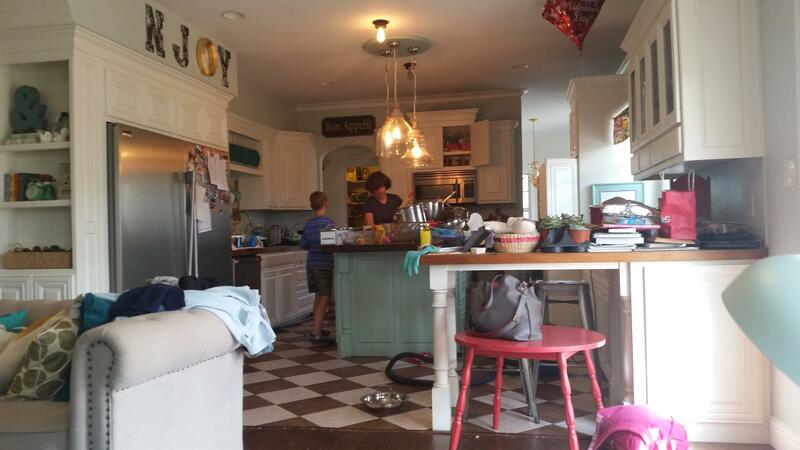 All of my kids (except Honor and–99% of the time–Theo) have been required to pitch in as we’ve organized closets, weeded, planted, swept, scrubbed trim, hauled out trash, and just generally given our house a much-needed shine-up. And, yes, there has been some fussing and complaining. But there’s been a lot more cooperation and hard work. I hadn’t told Shaun what we planned to do while he was gone (although, he knew that I would generally be working around the house to get things in shape), and the kids loved the concept of wowing Daddy with a surprise yard makeover. Simon–who started out finding things to kvetch about–ended up being upset that he had to have any help raking and clearing our entire (very large) front yard. He wanted to be able to present Shaun with a leaf-free lawn courtesy of Simon alone. He ended up needing a little help to finish, but that idea of ownership was a huge motivation for him. I don’t always encourage my children the way that I should, but I do try to take every opportunity to tell them how important they are to our family. Their worth is inherent, of course. But I also tell them almost daily how their help keeps a particular aspect of our household running smoothly. And they love it. They grin from ear-to-ear every time I praise their efforts. I don’t mean to broadly generalize, but it does seem that our society has something very backward when it comes to kids and young people in general. They are handed more knowledge (much of it completely inappropriate) than they know what to do with or have the maturity to process correctly. But they are given very little responsibility or true opportunities to grow in maturity through manageable, age-appropriate tasks and goals. What if, instead, we protected our children’s innocence while respecting their potential to contribute? What if we trained their hearts while shielding their minds from junk and praising their authentic efforts to help? Again, I’m far from perfect in this pursuit. But it is my goal. I want my children to honor God first with their attitudes and then be a blessing to others with the actions that follow (because just “doing the right thing” without the right heart attitude is only half the battle). And not just because it glorifies God or benefits man but also because it produces character and joy for them. Because I only want good for my children, but, just as hard is not the same thing as bad, easy is very often not the same thing as good. And seeing how my children glowed when their daddy got home and gushed with pride and appreciation for how hard they’d worked only underscored just how rewarding the results of training can be. ANYhoo, I hadn’t started this post intending to preach at you, but I hope that–if you’re in the trenches of child-training (I still am, for sure)–you’ll feel encouraged to hang in there. 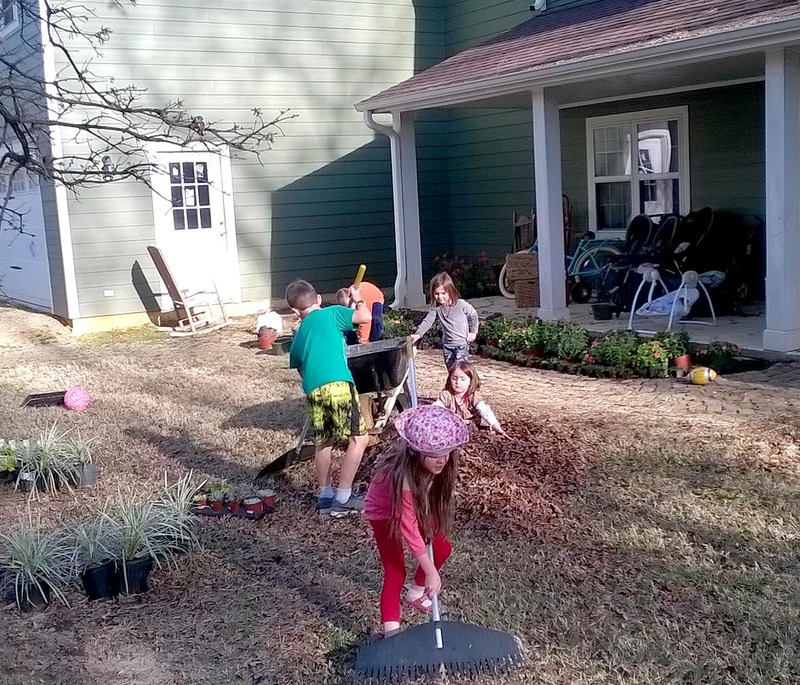 My children have spent the vast majority of their spring break weeding, mulching, cleaning, and planting. And–as Ezra cheerfully proclaimed after a full day’s work–”Getting stuff done is FUN!” (Not always how he feels about it, but the fact that it’s EVER how he feels is enough to motivate me to stay the course). So. Much. Progress. 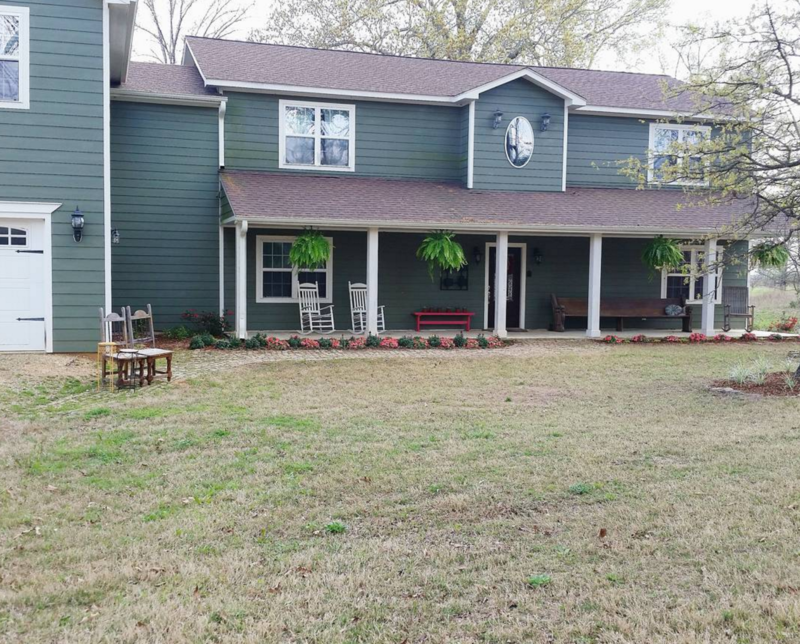 Want to come buy our house? Love this post. You amaze me with how much you get done with all those kids. Although I know you’ve already blogged a few times about parenting, I still feel like I want to pick your brain when it comes to child-training. Specifically when it comes to attitudes, as you mentioned. I have five kids and my two oldest boys (ages 10 and 8) especially seem to have trouble with bad attitudes and complaining, and occasional disrespect. My typical response to the disrespect is to chasten them, talk with them about it, and often assign an extra chore as consequence. But it still crops up now and then, and I’m not really sure what to do about bad attitudes and complaining, except to ask them to stop and encourage positivity. So my question is, what is your response when those issues arise in your children? And what do you feel was the biggest contributor to your boys having such positive and helpful attitudes? I think the BIGGEST thing for me is praise. I can tend to be critical or overly harsh (sad, but true), but, paradoxically, I’m also really good at praising effusively when I see something good. And I have noticed that EVERY time I do this, I see a boost in attitude and productivity (duh, Abbie). So, I try to do this more and more. The more I praise, the more cheerfully they work. Yes, I admonish (and sometimes punish) when there are bad attitudes, but my kids are almost never disrespectful (I feel weird typing that because it sounds so “go, me!”) because it’s just never an option in our house and because we watch/read almost nothing that models that kind of attitude (not saying you do). Also, the emphasis on how important their help is seems to help attitudes as well. Just the mere fact of telling them, “I couldn’t do this–or at least not well–without you because you are THAT awesome,” seems to majorly affect their motivation to work. Sometimes, when they are dragging their feet, I will pull them aside and simply say: “This is not you. You are a helper. You are the kid who looks for ways to support and come alongside. Whoever this is right now is not the true you. It’s not who God created you to be. And I know you want to honor Him. So, start being YOU!” That seems to be bump them out of their complacency as well. I know. Nothing revolutionary here. But I don’t have any amazing tricks for good attitudes. It’s something we deal with for sure. Just don’t. give. up! Even if they go through a rough patch, keep training, keep encouraging, keep training, keep disciplining, and keep PRAYING! Thank you, that is actually very helpful! I think in our house we tend to get into that negative rut of consistently correcting the wrong, but forgetting to consistently praise the good. If I heard more about what I was doing wrong than right, it would probably affect my attitude as well. Definitely something to work on. Intrinsic motivation is the best kind, I I think that part of that is occasional reminders of our worth and our potential. My four youngest nap every day. And EVERYONE is required to nap (or at least be very quiet) for 2 hours on Sunday afternoon. The older ones have room time in the afternoons. They have to go in and can’t come out or “bother” me for an hour. Thank you so much for the encouragement! I’m so blessed by hearing your goals for you family and try to take away little things that can help us. Can you share how you handle discipline? Or is there another post where you share that? Thank you! I haven’t specifically written a discipline post because it’s such a fraught topic. But we do spank (the older boys almost never get spanked anymore. They just lose privileges). We do the penny system (that I blogged about…you can type “penny system” in the search bar on my blog if you haven’t seen it) to encourage good attitudes and going out of one’s way to help/work. And I will send them to their rooms or a corner if they can’t figure out a way to calm down in my presence. We also talk A LOT about heart attitudes and why we do things “as unto the Lord,” but, at least when they’re little, I think our most consistent “training technique” is spanking. Now to pick your brain on overcoming raising twins (mine are now 3) and the constant affect they have on each other. Ex: feeding off of one another, tormenting one another, encouraging one another to disobey. Oh, girl. 3 is HARD. Always, but ESPECIALLY with twins. They definitely gave me a gray hair or two. So far, 4 has been so much better because the ability to reason/control emotions is so much better. Hang in there. Keep doing the things you know you must (disciplining, teaching, separating, punishing, etc.). Because the “bad” effect they have on one another can definitely be used for good too. Thank you for your encouragement, as always! Boy, have I given into the easier side of things these past few nights. I have been letting kids snuggle with us or snuggling in their beds instead of putting them straight back as I should. I am currently 37 weeks and am finding myself vascilating between being so done and way not ready to give up sleep at night again ( not that my 13 month old always sleeps through, but anywho). I was wondering if you let your kids play any type of pbskids games when they have finished their chores. My hubby, who used to be way too into gaming, assures me it is fine, but I don’t really know. Honestly, girl, sometimes, we need to snuggle those babies, guilt free. There’s nothing wrong with that. It’s when we find ourselves *consistently* choosing the easy way out and forming bad habits that we need to check ourselves. 37 weeks. Phew. You know I was just there. Give yourself some grace for sure. Oh, and our 3 oldest get an hour of game time a week–not even educational. They can play Wii for 30 minutes on Monday and then 30 minutes again at their Softa’s (my mom’s) house. They love it, but they don’t miss it the other days. Other than that, yes, they do some educational games at my mom’s house, but never really here. I don’t object strongly (although, we would never do very much). We just don’t end up with much time to do it, honestly.